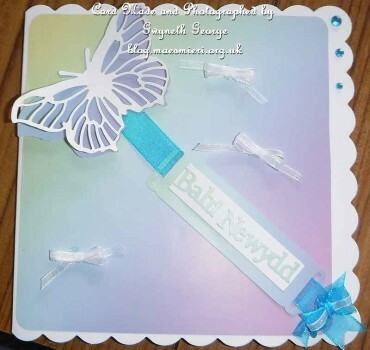 January and February sees several family members having their birthdays therefore it’s time to get busy makeing some Welsh “Penblwydd Hapus” birthday cards after the Christmas and New Year season is past. Today I’ve got two cards I made for my mother and myself to give to my niece. 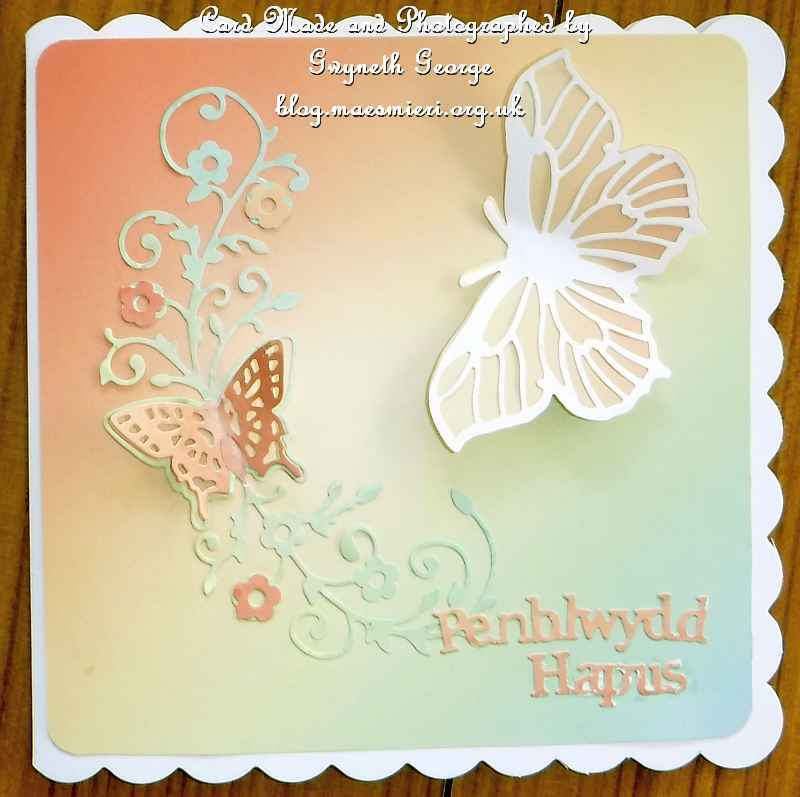 They were made using some items from one of the Hunkydory Decolarge kits I’d used when makeing the variety of Welsh Birthday Cards for an order that I’ve started to show you previously. 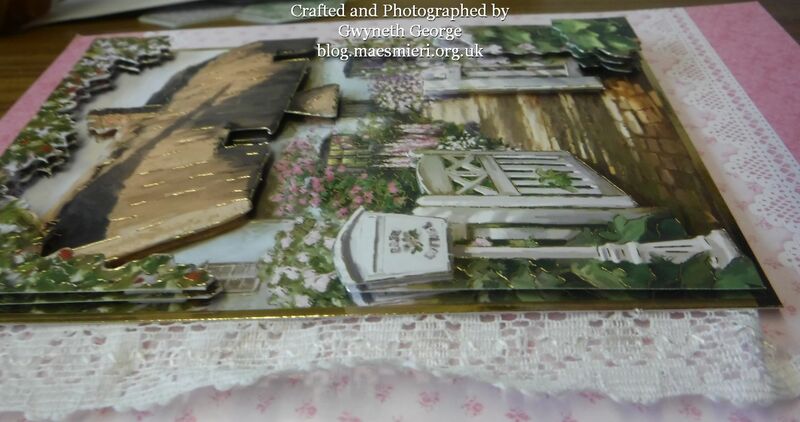 But these have been put together in a slightly different layout with some difference in the layers I chose to use for the decoupage (I did say in my previous posts how I wasn’t using all the layers provided for the decoupage and therefore getting a second topper out of what should be each very deep decoupage). 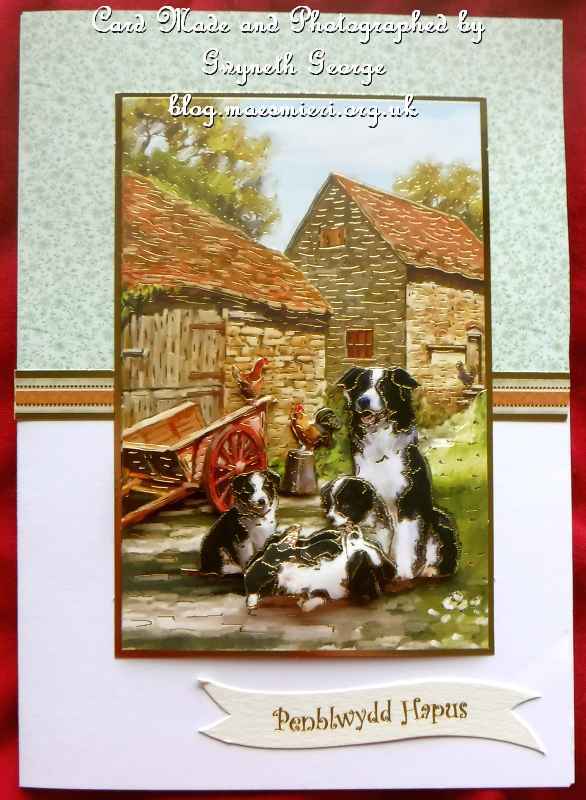 Both cards are of country cottage scenes. This first one has a rectangular topper. I used a sheet of cardstock from the same kit, and as the cardstock has a bit of a lacy look I added a piece of lace under one edge of the topper. I used 2mm deep, foam tape, to attach all the layers. Here are a few more photos of the same card from different angles to show the dimension of the topper. 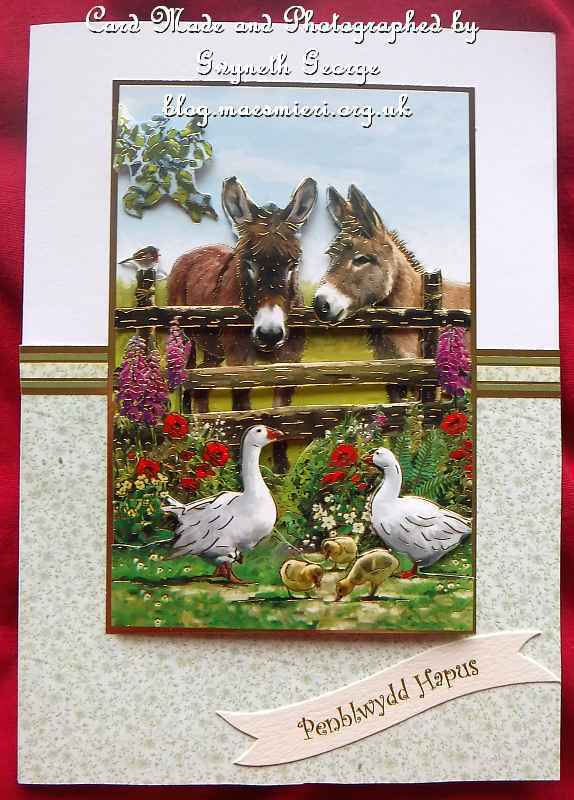 The second card has an oval topper. 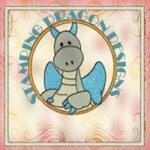 Again I used a sheet of A4 matching cardstock from the same kit to score and fold to make the base card. And next are a couple of photos to show the topper dimension. I’ve got several more cards to make for the family, so keep an eye out for them, along with some other crafting projects I’m working on. Hi Everybody! If you don’t want to read all my ramblings and just want to see my creations then I don’t mind if you whiz past the first part of this post. The cards are near the end! Well, I’m still plowing my way through the photos of the items I crafted last year but didn’t put up on my blog. I’m also in the process of crochetting another wooly hat for another nephew. Hopefully I’ll be able to show you that before long. 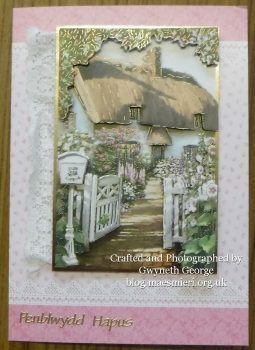 I have to admit that, while I can appreciate the work that goes into them, and the tallent of the crafter, one type of card just isn’t my style and that’s “dark” cards generally. I prefer my cards bright and cheerful, or nice and pastel. Something to make me smile or chear me up. But of course that’s me, not everybod. I know that there are those recipients who are into that sort of thing and that the cardmaker is spot on with their creation, but what does a crafter do with cards of this type if, say they are really into this type of card themselves, or ar on a design team that wants this type of card, but actually have nobody to give them to afterwords? Do you keep them in a box forever? Do you give them to charities? Do you box them up and give them as a boxed set gift to somebody? Do you find some way to display them yourself – say in a picture frame or something? 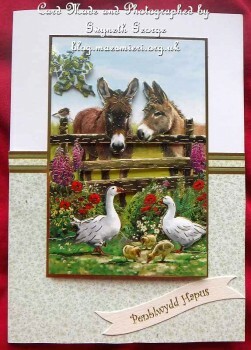 The same goes for any other style of card of course. 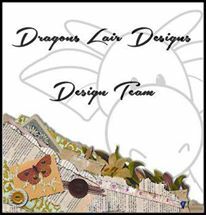 What do all you crafters out there do with all the cards and other creations you make? Do you manage to sell some cards. 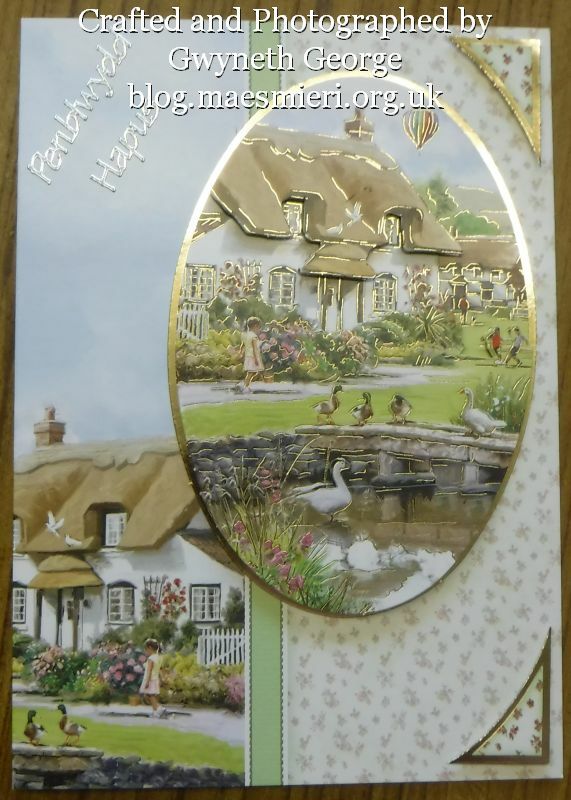 I read online lately that somebody on the TV had quoted a really large price for a hand made card that had been personalised, and that she was actually getting that sort of money. 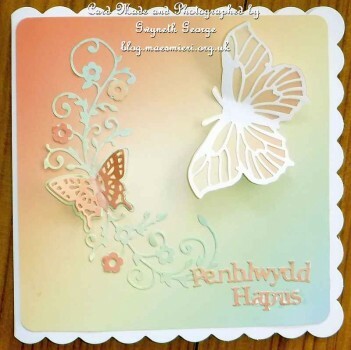 I didn’t manage to actually see what size and standard of card was involved, but I doubt whether it was of any better standard than some of the stunning creations I’ve seen online over the last year. So then I got to thinking about whether those I’ve read sell their cards for £1, £1.50 or even £2.50, and still not getting sales, are under priceing their cards (I’m sure they can’t be covering the cost of everything they’ve used yet alone the cost of their time to make them), and does having the balls to charge £10 + for a card make those with no sense think that the card must be better in some way than a card that the maker is charging much less for? Does the fact that some people just want to have the space and are practically giving their cards away for realy cheap prices make it harder for others to charge realistic prices for their creations? For all my thinking I haven’t worked out the answer to any of the questions I’ve thought of while being incapacitated. Anybody out there getting a steady stream of card sales for reasonable prices? I’ve got two cards to show you today. 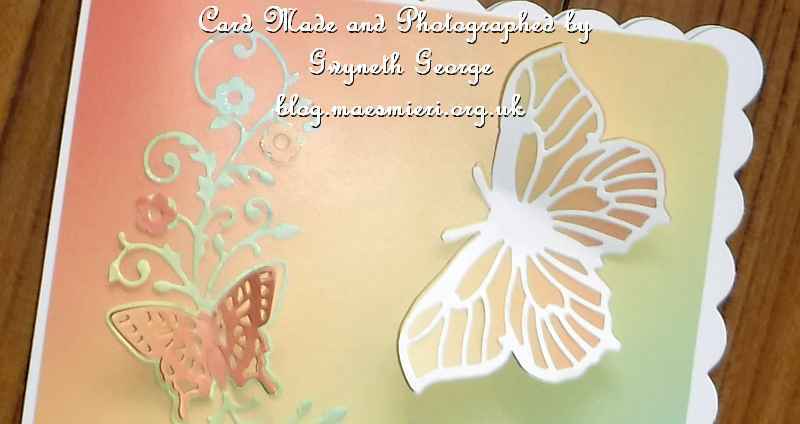 Both were made using the same butterfly die – not quite sure which company’s die it was – that’s one big problem with not having the health or energy to blog soon after making cards – I just can’t remember exactly what I used to make my creations, or where I got the items from to link to them. 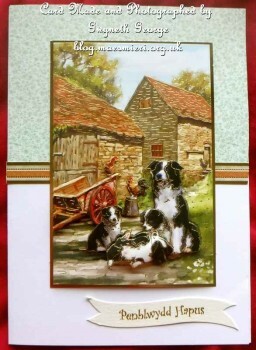 Thinking back to who they were for – these cards must have been made between Christmas and the New Year. Both were also made using the same type of cardstock and backing paper – It was a paper with a wide variety of colours going across it and by cutting out of different areas I got a different affect. 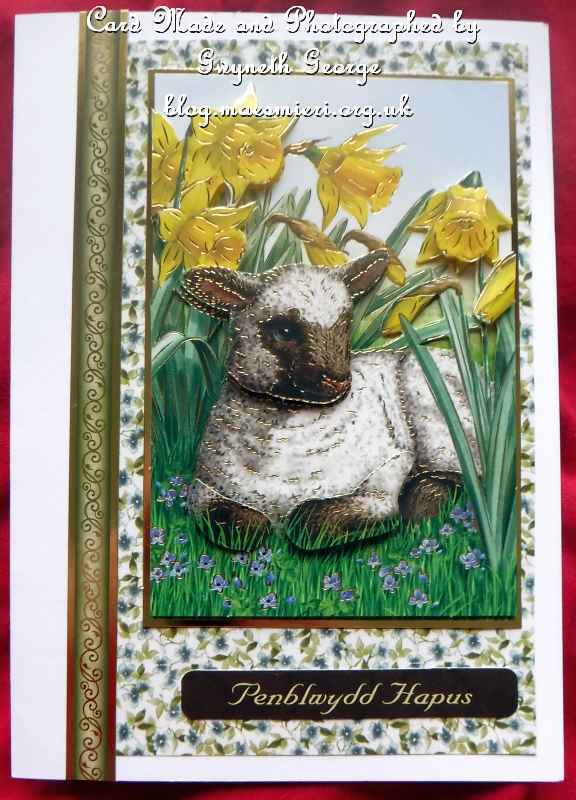 I do remember that the two greetings dies came from Tattered Lace – because Tattered Lace are the only Welsh greetings dies I’ve got. Would you believe it but I’ve found I’ve got close to one and a half thousand photos from last year to sort through. That doesn’t mean that I crafted nearly that many items during the year though. Some of the photos are of family members, etc. 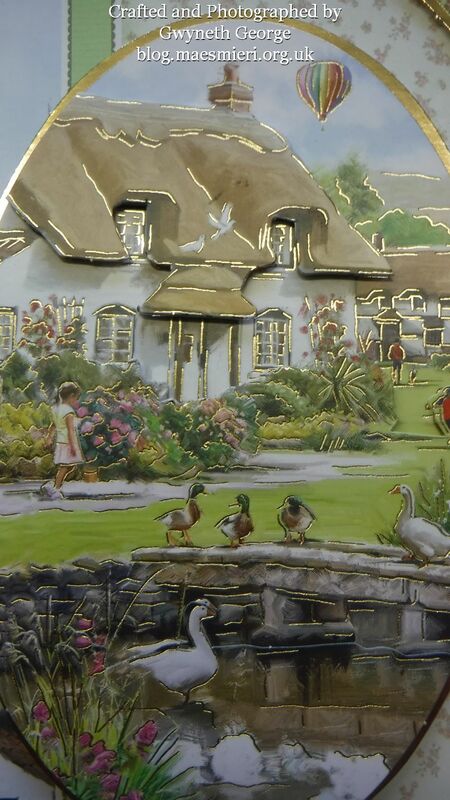 Of those that are of my crafted items – there are quite a few photos of every item. I take several photos of each piece from slightly different angles and distances so that I can choose the best image to use here on my blog, and also have close-ups of some things. Sometimes I still don’t get a good photo – but I go with the best I’ve got and hope people like what they see. 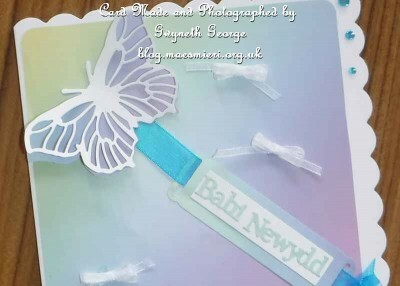 So, while I’m on a roll of sorting out, and if my health doesn’t take a downward turn again, you may find that I manage a few blog posts every week for a while. I’m not going to push for daily posts as I do want to do a bit of new crafting as well, not just post what I did last year and in January this year, so we’ll see how I get on with things. I said in my last post about my health problems last year – and that I had lots of time to lie here and think. 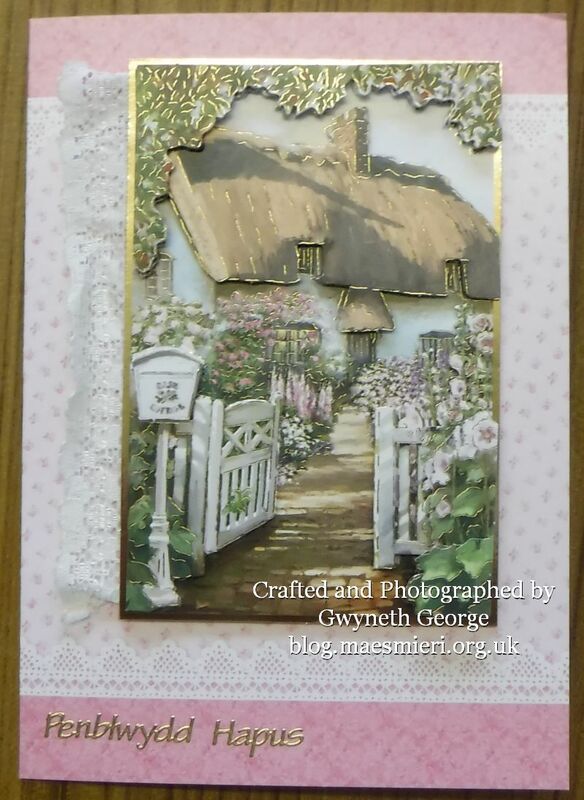 One thing that caught my attention is the shear variety in card styles that the tallented crafters who post pictures of their cards online have made. Trying to write comments on blogs on my tablet is difficult, erratic and frustrating. But the fact that I haven’t done a whole lot of commenting either on blogs or on Facebook for quite a while doesn’t mean that I haven’t been browsing around and appreciating everybody’s work and being so thankful that there are so many tallented crafters out there who are willing to take the time to photograph and write about their work. Just being able to see what everybody has been creating cheared me up a lot when I couldn’t do much myself – and gave me some ideas of things I’d like to try as I get better healthwise. One thing that I thought quite often was “where did she/he get the idea to do that!”. I’ve seen some stunning work appear online. There’s been the nice, the good, the excellent, the stunning and the downright outstanding (very rarely a “what was she thingking!”). 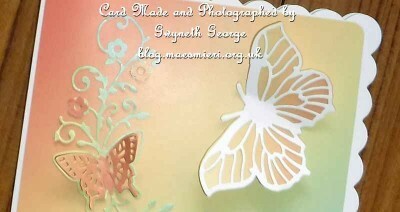 And sometimes it seems as if it’s the tinyest difference or the little detail that turns a lovely card to a stunning card. 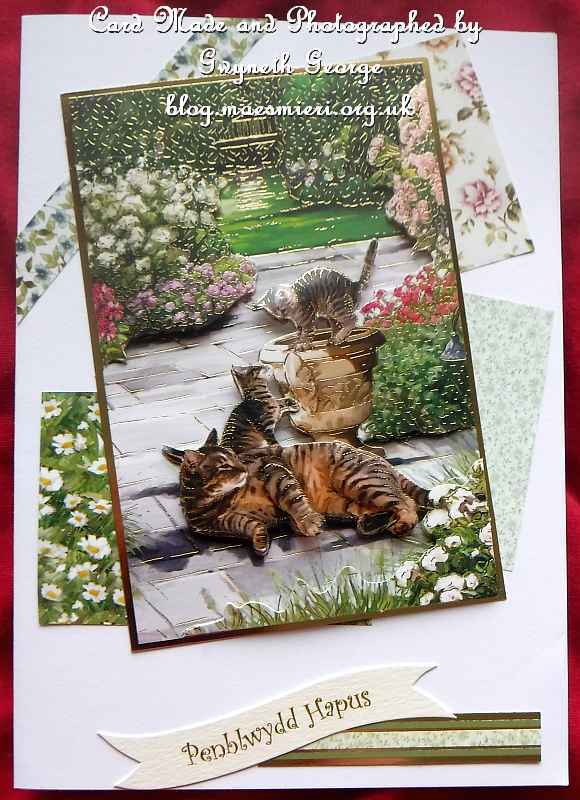 And sometimes I can look at a card for ages and try to put my finger on what I like about a card and just can’t get it – I just know that I think it’s stunning. And then I got to wondering about whether others thought the same cards stunning. And thought – probably not, because everybody’s different and has their own take on things and own preferences. And that’s good, isn’t it. The world would be a boreing place if we all liked everything the same. 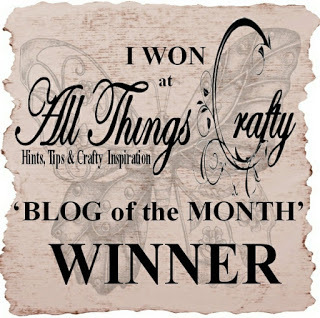 One of the most facinating things has been browsing around lots of blogs where the crafters have been using the same images or collections and seeing the variety of the makes. Hard to believe sometimes that the material they were working from is the same. When my health is middling and I feel like making something but don’t feel I’ve got the energy to colour or die cut or get lots of things out, that’s when I turn to kits, especially those with die-cut elements in them. I like to keep a few kits in the house ready for times like this. I got tempted lately by the Hunkydory kit with the Megapage die-cut decupage in it. 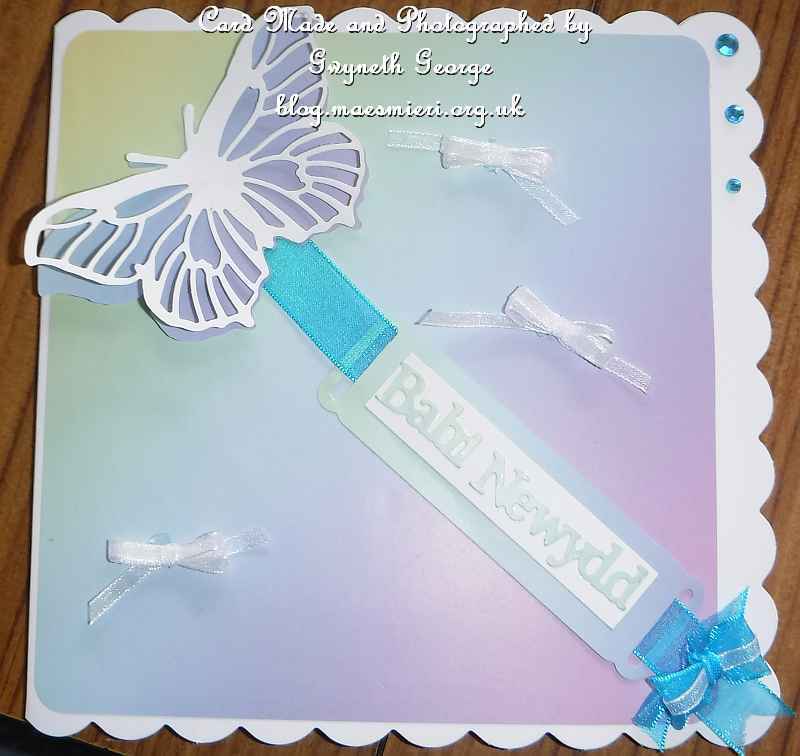 Some fingerlift tape, Pinflair Glue Gel, a trimmer and scoreboard, and I made several cards for up and coming family birthdays without using up my energy getting out loads of crafting equipment and consumables. 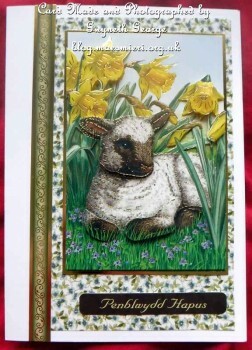 So today I’ve got 4 Welsh birthday cards to show you. I hope you like them.